If you don't have the expertise in-house, what better way to achieve your goals than to introduce S?nnet Beskerming Consulting services. It is an unfortunate reality of modern business that many projects end up shipwrecked (much like the background image above) for a number of reasons, be it due to management, resources or over-commitment. S?nnet Beskerming consulting can help companies steer projects back on course and pilot around the risks that they face, or help wind down doomed projects before they cause excessive damage. Key company personnel are experts in project management, and have successfully implemented and managed multi-million dollar projects for previous clients - imagine what they could do to help your company. Ever wondered why the technological revolution never really delivered on the promise of easing your worklife? Fearing the migration of your legacy systems to modern systems? Purchase and use of hardware and software is not sufficient to meet modern business requirements without the application of careful thought and advice. Even the decision to purchase solutions requires an understanding of how the technologies meet with the business needs. In addition to the other services and products from S?nnet Beskerming, we offer consultancy services to help clients select and implement the most suitable solution for their situation. Information Technology does not exist in isolation, nor does it remain stationary, and what may meet a business need at one point in time may not continue to meet the same need as technology improves over time. Likewise, a business need which meets a current technology may evolve to necessitate the acquisition of technology and practices which meet the evolving need better than an existing technology. We here at S?nnet Beskerming are dedicated to providing our clients with solutions that meet their needs as they grow. In addition to the services that are listed on the security section of our site, we offer additional security consulting to assist you with determining the most appropriate security products and services for your needs. Our consultants will always advise the best possible solution, even if the software or services being recommended do not come from S?nnet Beskerming. This places us in the excellent position of being able to objectively supply advice and guidance to your company. A lot of the services that S?nnet Beskerming offer come under the scope of general Information Technology consultancy. Guidance and advice for network layout, system choice, software licencing, and other Information Technology elements which do not fit within the other services offered by S?nnet Beskerming, are covered by the general Information Technology consultancy offered. The rapid pace of technology growth, and subsequent growth in security problems, has significant implications as it becomes more difficult to keep up with what may help and what may threaten your business. It is particularly difficult if it is not a core business requirement to maintain this level of knowledge. This is where we at S?nnet Beskerming can help. We constantly research and follow the latest news across the technology sector, with particular focus on vulnerabilities and other security related matters. Our staff have a fantastic ability to interpret technical documents and deliver reports in non-technical language in a manner which does not patronise either the technology neophyte or the guru. As technology is a global concern, we track and monitor various reporting bodies throughout different countries, and use these multiple sources to deliver balanced reporting and analysis. This is especially useful for controversial news, rumours masquerading as news, thinly veiled press releases pretending to be news, and for identifying the specific details surrounding new threats to networks and systems. Anti-virus companies, in particular, have difficulty reporting the same variant of a threat with the same identifier. This causes confusion and uncertainty amongst end users. Through the use of S?nnet Beskerming's reporting and analysis, you can avoid being swamped by misinformation and conflicting reports by recieving accurate reports - first time, every time. S?nnet Beskerming offers system review services allowing clients to gain confidence with their systems and software and meeting reporting requirements for office holders. 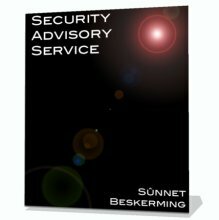 These services are closely related to the Security system and application reviewing capabilities offered by S?nnet Beskerming, except these services focus more on the holistic system without a focus on security or system integrity. These system review services can help you understand how your networks and system capabilities have evolved with time, and assist with the improvement of network and system efficiency. The services can also help you reduce your overall Information Technology cost by allowing you to gain an accurate picture of the number of software licences required, and the most suitable licencing for your situation. Avoid paying for licences that you don't need and will never use. In addition, using a system review to fix your licencing status will allow you to withstand an external review from organisations such as the Business Software Alliance, or snap licencing reviews from major software vendors such as Microsoft. There are many other areas of your business that could benefit from these regular system reviews, such as insurance estimates, asset inventories, policy development, Human Resource management, regulatory compliance, and much more. As a part of making a decision for acquiring infrastructure and software, being able to make an informed, careful decision allows you to gain an easy competitive advantage. S?nnet Beskerming staff work hard to ensure that you are able to make the best decisions possible, providng you with the competitive advantage. S?nnet Beskerming analysts specialise in interpreting the latest technological developments and being able to provide their analysis in essentially a non-technical manner. This allows key decision makers to understand the technology in a way that they might find easier than intepreting the raw technical specifications themselves. In addition to providing the analysis services on technology that is in the news, S?nnet Beskerming analysts also perform research and analysis on technology that may be in development at the time. This is an invaluable service for Venture Capitalists and other investors who are considering investing in a technology company or product. Our analysis reports can save clients millions of dollars in poor investment decisions by demonstrating, for example, that the proposed technology / product already exists and is being offered for free or at a cheaper price point elsewhere in the world, and the proposed Intellectual Property protection is unlikely to eventuate due to existing patents.